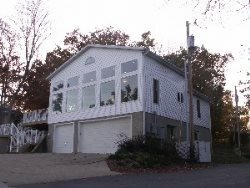 Sunset Cottage Vacation Rental Home Lake of the Oarks Missouri Property Managed by Crystal Water Villas, Inc. This home comes packed with everything a lake vacationer would need. The living room boosts extra comfortable furnishings, a large brick fireplace and full size futon. The kitchen comes with dining for four and an additional seating at the breakfast bar. Directly behind the living room and kitchen are the two bedrooms. One bedroom has a queen size bed and the second bedroom has three twin size beds. Off the common hallway is the darling tub/shower bathroom. This landscaped property is a true paradise for lake vacationers. Guests have access to plenty of open parking and will truly enjoy the terraced yard and large oak trees. This wonderful property offers spectacular views of the lake from the deck (partially covered) and the evening sunsets are unbelievable. Both the entry area and kitchen have access to the large sun deck, and vaulted outdoor sitting area that overlook the Lake. Water and boat lovers will enjoy the large covered dock with two boat slips and swim deck. Fishing is ideal with planted crappie beds off the dock. A covered boat slip (10x26) is available to rent on the private dock for $10.00 per day. This 1,100 square foot vacation rental boasts all the conveniences of home, featuring central heating and air conditioning, TV, DVD, phone, all bedding, bath and dish towels, and iron with ironing board. The kitchen is fully furnished and includes a dishwasher, range, microwave, and refrigerator. Other features include weekly trash pick-up, garage and open parking, and laundry room access. This cozy property is just 10-15 minutes away from all the action on the busy side of the Lake – Bagnell Dam, Lake Ozarks, and Osage Beach – via the community bridge. Once you are here plan to take in any number of lakes attractions including state parks, theme parks, cave explorations, golfing, go-karts, theatres, bowling, music shows, museums, and of course lots of shopping. We can help with any of the details of your vacation planning and would be glad to mail out vacation guides, restaurant guides, state park guides, etc. Our hospitality is yours for the asking! Rates are based on a 6 person occupancy. NO Additional Guests Permitted! A covered boat slip (10'x 24') is available at no charge. Mandatory Departure Cleaning Fee $115. Very nice, thoroughly enjoyed our stay, only problem, we couldn't stay longer!!!!! We had a great time at the lake last weekend. Everyone was so helpful from arrival to departure. We will be back! We LOVE this property and cant wait to come back. We are so happy to have it be part of our family tradition! Came to celebrate our wedding anniversary and enjoy a scenic peaceful view that didnt disappoint. Location wasn't as secluded as pictures lead to believe but we still were not bothered by this. Though pet friendly lacking good places to walk dogs the slope takes up a majority of yard and only flat surface was mainly mud and a long distance away if trying to take them out for a potty break, luckily the deck allowed plenty of space for them to run around. I do agree from past reviews that the mattresses on the queen sized beds are weird, they are only comfortable if you sleep as close to center as possible otherwise feel like you're rolling off of side. We enjoyed the full kitchen very much and got to do a lot of cooking that we normally avoid in our small kitchen at home. We had a fun, relaxing stay at our vacation home. We had everything we needed for a week on the lake. The private dock worked perfectly, we were able to rent a pontoon for a few days. When we weren't on the lake, we were relaxing on the huge deck, barbequeing supper, playing board games, or just taking advantage of the home's large screen tv to veg out. There are so many restaurants in the area that we never ate at the same place twice. All in all, this vacation was just the get away we needed! Everyone had a blast and they kept commenting how beautiful the house was; I hope we left everything the way we found it. Thank you again for an awesome experience!